I had a pretty good day yesterday. 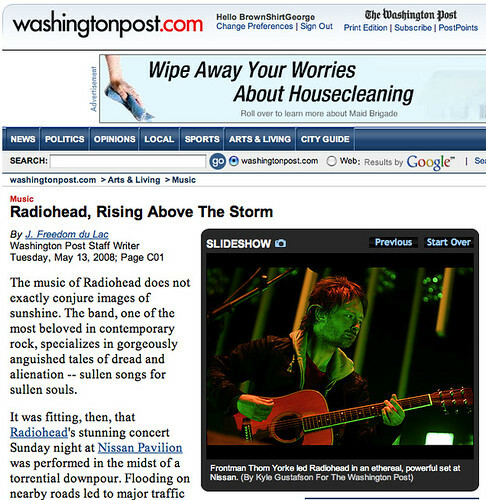 First the Pitchfork thing, and then late yesterday afternoon I got a call from the Washington Post asking me if they could use some of my Radiohead shots to run with J. Freedom DuLac’s review of the show. I had to rush home from work and get them edited and handed in, but it all worked out. I got quite a rush this morning buying a copy of the paper and seeing my photos in there. Front page of the Style section! Pretty exciting. Special thanks to the fine folks at PrefixMag.com for letting me send the Post some photos even though I was on assignment for them. I’m looking forward to shooting even more stuff for Prefix in the very near future. So, enough of my babbling. Check out my full set of Radiohead & Liars photos on Prefixmag.com. 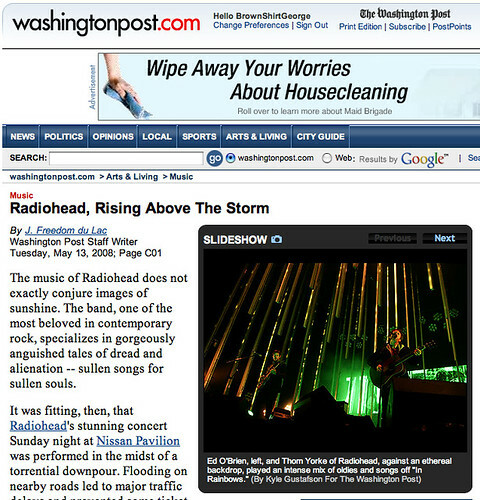 Check out my two Radiohead photos on Washingtonpost.com. Screenshots from the web edition after the jump.